The idea of ​​this work, Escaleras sin Fin-2 (Stair/Cases-2), was originated from certain disturbing concepts in the universe of the artist M. C. Escher; choreographic situations are developed in staircases of the past and the present, diverse characters climbing, competing, climbing to reach an objective, the highest scale… and then falling again. A line of time and life, a fantasy metaphor constructed through a methodology of geometric editing, in close harmony with the contemporary music of the Mexican Composer Carlos Sánchez Gutiérrez. This work was made in the special circumstance of an Arthur W Mellon artistic residence at the University of Washington in Seattle, the inspiration came from the variety of stairs that the city unfolds. 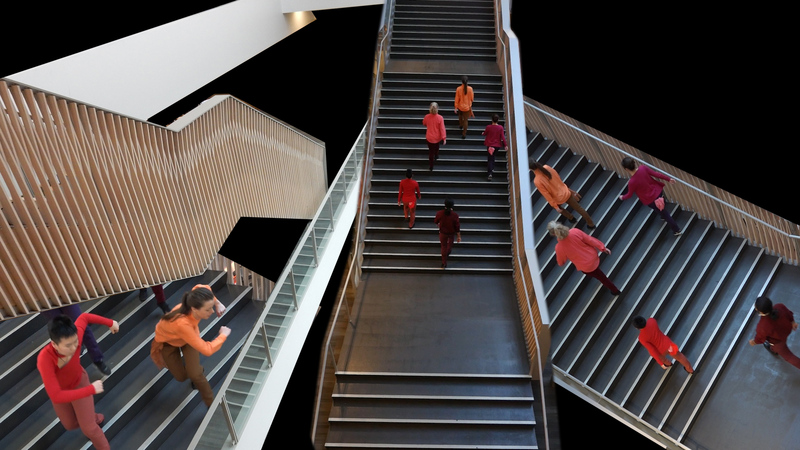 Escaleras sin Fin-2 has been created to conceive a story “site specific” of movement in video format. Financing: artistic residency with Arthur W Mellon Scholarship at the University of Washington, Seattle, U.S.A. Performers: Sophia Arnall, Shane Donohue, James Fesalbon, Dolly Huang, Timothy Johnson, Leslie Kraus, Kyki Li, Rachel Lincoln, Juliet McMains, Tessa Magnuson, Robert Moore, Austin Nguyen, Pam Olson, Zakk Rahman, Fausto Rivera, Jordan Rohrs, Lea Russel, Hallie Scott, Pamela Schick, Serafina Shi, Brandin Steffinsen, Za Thomaier, Connie Villenes. Choreographer, videographer, video-installations and videomapping director. Graduated in Biology, University of California Berkeley. 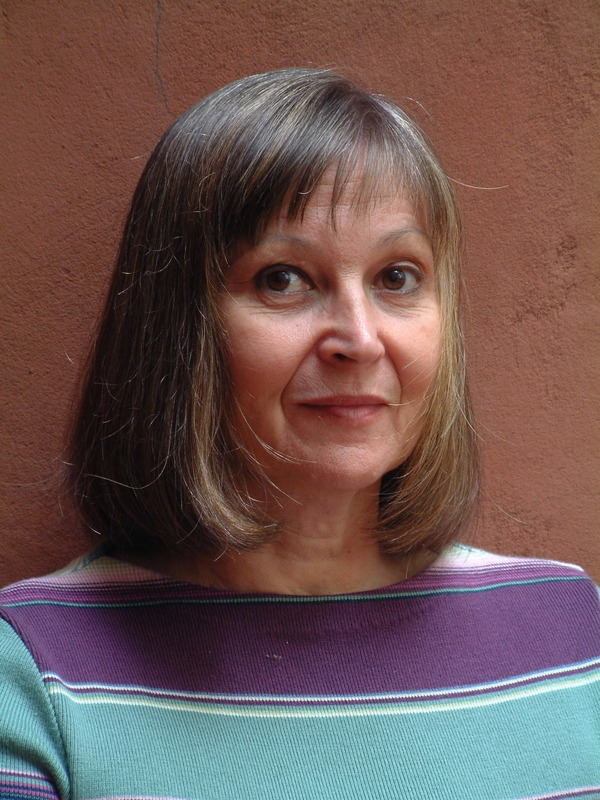 Co-director of the Argentinian company NUCLEODANZA with 25 years of international experience. GUGGENHEIM SCHOLARSHIP 1998, SCHOLARSHIP BUCHAREST 2001. Awards: ALEXANDER ONASSIS FOUNDATION Athens 2000, FAENA DE ARTE Y TECNOLOGIA 2006, AACA GERMAINE DERBECQ 2006, 2nd GYULA KOSICE BIENNIAL PRIZE 2012, TRAYECTORIA EN DANZA Fondo Nacional Artes 2017, ARTHUR MELLON FOUNDATION 2018 Scholarship in the U.S.A. Last choreographic works: Pizzurno Pixelado (architectural mapping and live performance), Ojo al Zoom (interactive), Galaxias y Hombre Rebobinado. Video installations: La Duna es Movil, Medusas III, Pulmotor, El Acuario Electrónico, Vuelo Rasante. She has made 12 screendance pieces with numerous prizes. Interview to Margarita Bali, talking about her creative experience. Filmed via long distance computer call: SKYPE.